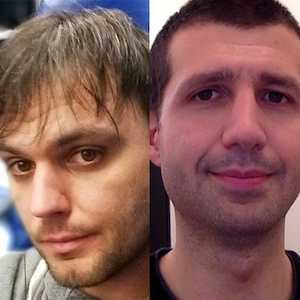 Fabio Biondi and Matteo Ronchi are active contributors in the italian front-end community both with 10+ years of experience in developing enterprise level applications. Their knowledge ranges from custom user interfaces to cross-platform interactive applications, mobile hybrid Apps, data visualization, home automation systems and smart cities. Especially focused in front-end apps and all related aspects both visuals and architecturals, they excel on cutting-edge libraries and frameworks offering training, development and consulting on AngularJS, React, D3, and several other technologies. The workshop will guide the attendees through four stages of exercises. Every phase will starts with basics theory followed by guided practical applications. Most of the required code will be already in place letting the participants focus only on React and on its core concepts. Expert web developers (in any language) that want to start using React, Webpack and ES6 to build data-driven web applications. Particularly indicated for AngularJS developers that need to quickly jump into the React world. Working knowledge and practical experience in any programming language. Knowledge of basics HTML and CSS is not required but preferable to augment the learning experience. Before the workshop the attendees will receive instructions to clone a git repository and install its dependencies. Alternatively only latest VirtualBox must be installed. VirtualBox is required to install a pre-configured VM with complete setup to support all the workshop activities. Before the workshop the attendees will receive the link to download the VM image.